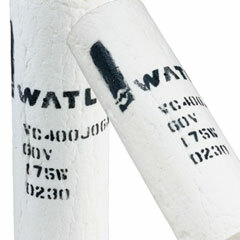 Ceramic fiber heaters offer some of the highest temperature heating element capabilities in the Watlow family of heaters. Heating units constructed of ceramic fiber insulation isolate the heating chamber from the outside. Ceramic fiber heaters are extremely low mass, high insulation value units with self-supported heating elements. Many applications can benefit from the convenience of the heating element and insulation combined into one package. Its lightweight, low-density properties make it ideally suited for high temperature applications requiring low thermal mass.